Hello! I am thrilled to be joining the Ton's Summer 2017 Release Blog Hop! They have some absolutely gorgeous new products! My first card uses the gorgeous set called Fresh Cut Anemones and Wave. I have to tell you that Wave is SO cool! It has three layers of stamping and just looks amazing when it's all done! I stamped the wave first and the sentiment. Then I stamped the flowers and leaves, and fussy cut those out. I adhered them with foam tape, then cut them off flush with the edge of the card. 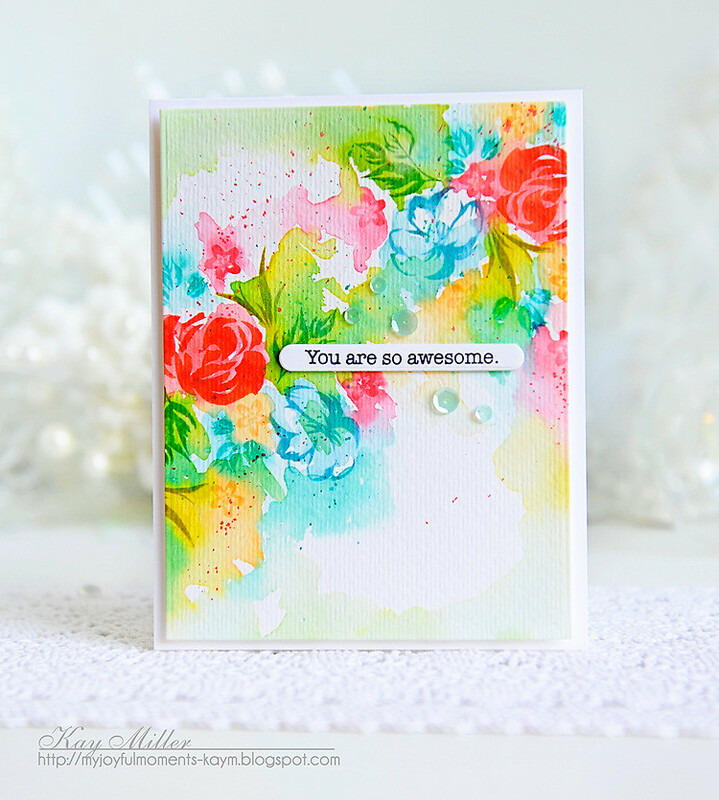 My next card uses a beautiful new set called Watercolor Wreath. It has the flowers already arranged in a wreath you can just stamp, or single flowers to create your own wreath or arrangement. I used the single flowers and leaves here. I used Master's Touch watercolor paper and Distress inks. I stamped all of the flowers and leaves, and then took a wet brush and a little more of the inks, and went around each flower to create a watercolor look. I let each color dry before starting the next one to keep some of the colors from mixing together. I stamped the sentiment from the Wave stamp set and adhered that to the center of the card with foam tape, then added a few sequins to finish it up! The Ton has 24 new stamps for their new Summer 2017 Release which includes up to four free gifts with purchases. For more information on The Ton’s incentive gifts, head over to The Ton’s blog HERE. All new release products are available now! Kay Miller <- Me! I'm the last stop! Thank you so much for stopping by! Enjoy the hop! Stunning cards! The layered stamps in this release are absolutely gorgeous! Amazing cards, Kay. That wave one is so cool. Stunning & Amazing... those comments have been used. I'll add gorgeous and breathtaking. The colors are so beautiful... thank you for sharing. Gorgeous floral cards. I love the bright colors you chose. LOvely cards! I have been drawn to the wave cards all thru this hop, but this time i am even more drawn to your last fabulous floral card. Kay, I absolutely LOVE your cards. Fantastic colors. Beautiful cards, I feel the urge to visit Hawaii! I love the colors you used to stamp your stamped images. So bright and cheery. so gorgeous! i love how cheery they are! So much colorful goodness--your watercolor wreath is so awesome! Well, you're not my last stop :) Two GORGEOUS cards, Kay! 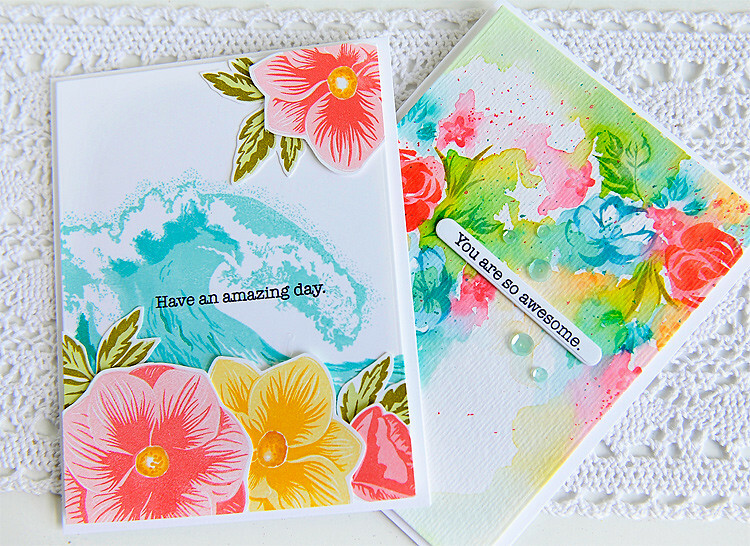 I am loving how you stamped the wave behind the blooms and your watercoloring on the 2nd card is just beautiful!!! My wishlist is growing after seeing your lovely creations...Thanks! 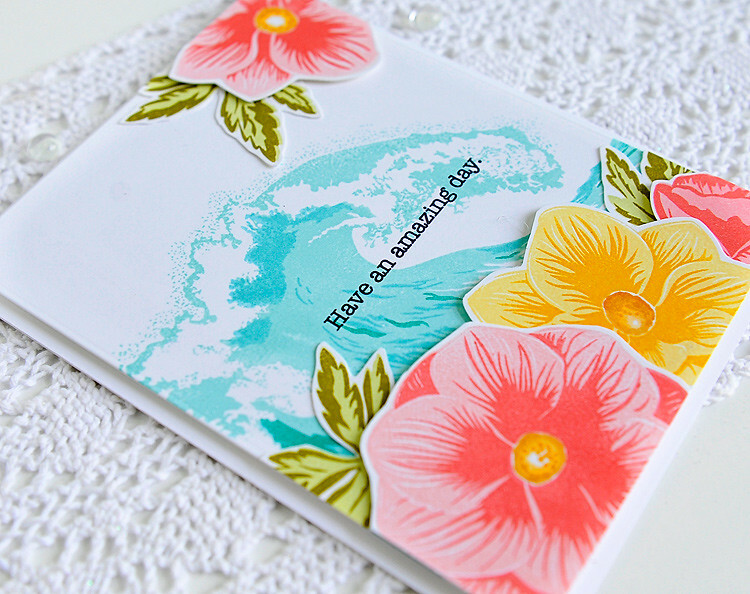 Gorgeous cards, love how you combined the waves with the flowers. Wasn't sure about the wave at first but after see all of the beautiful creations now I need to add it to my wish list. Thanks for sharing. Even if I didn't know whose blog I clicked on for the Hop, I would immediately recognize your work. Stunning, as always. Aaaah.....so this is where you have moved to...hmmmmm...gorgeous goodness as always....love the watercolour. The colors of both of these are beautiful! The flowers and the wave... tropical genius! I love the flowers and wave combo! Wow! The colors you used really are vibrant & beautiful. Beautiful cards! Love the colors you used and the watercolor one is so gorgeous especially with the pops of red. Gorgeous job. Omega your 2nd card so softly water coloured is stunning. Gee, your cards are beautiful! I love the Wave but the Water Color Wreath really speaks to me. Awesome cards. Your Waves and Anemones card has a tropical look to it and love the vibrant colors on the Wreath card. Oh my goodness your card is gorgeous! Love the wave and the flower mixed. These are both nothing short of spectacular!! beautiful cards, great water coloring! Yikes! wowza! OMG! Your cards are Gorgeous! 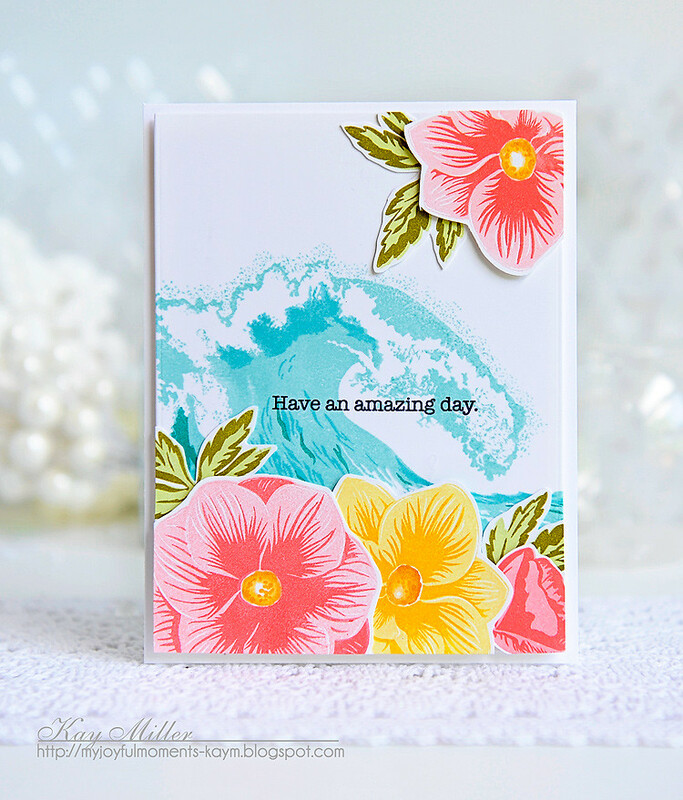 I love the waves with flowers, i lo e your flower card too! I absolutely love your work! Your first card looks like a scene from Hawaii. So pretty. And of course I always love your beautiful watercoloring. Thanks! The wave card is so great. It totally reminds me of Hawaii. These cards are absolutely gorgeous and vivid! The recipients will be so happy! Thanks so much for sharing! Gorgeous! Love the different looks. Love the watercolor! Completely different looks, but love them both! Especially love that second card, beautifully made! Beautiful cards. Your watercolor wreath card is amazing. Can't wait to try that technique. Gorgeous cards! Love your beautiful coloring! 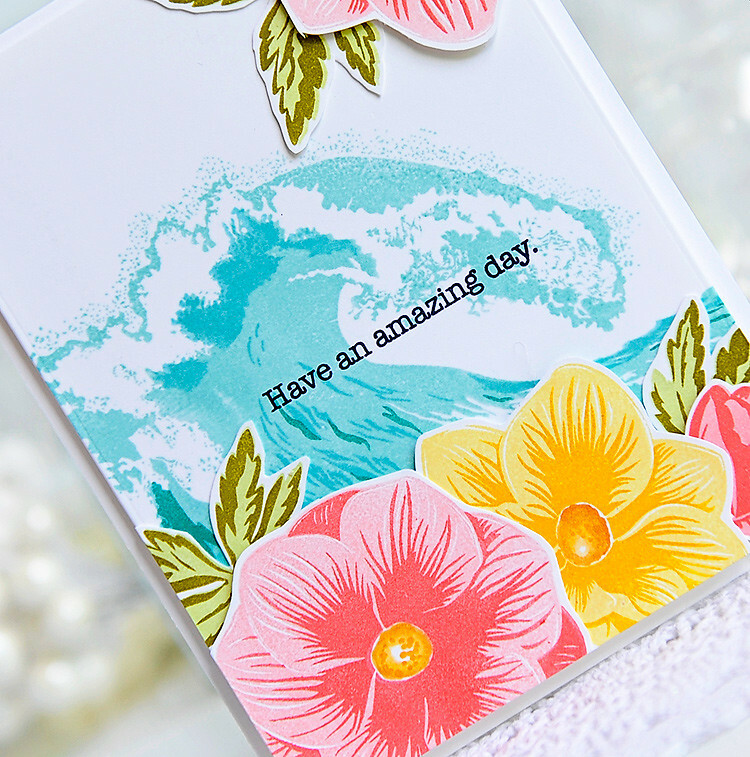 The wave stamp set is an absolute favorite of mine... love the way you combined the flowers for a tropical feel! Awesome release! The way you combined some of the sets made such amazing cards. The gorgeous coloring really makes them pop! Gorgeous bright and summery colours...the first one makes me think of Hawaii and surfing. The colors in this card are beautiful!!! Love the wave 🌊 on the first card and the watercolored card is quite stunning also! TFS! Kay, your first card reminds me of Hawaii! The colors on both cards are so fresh and pretty. 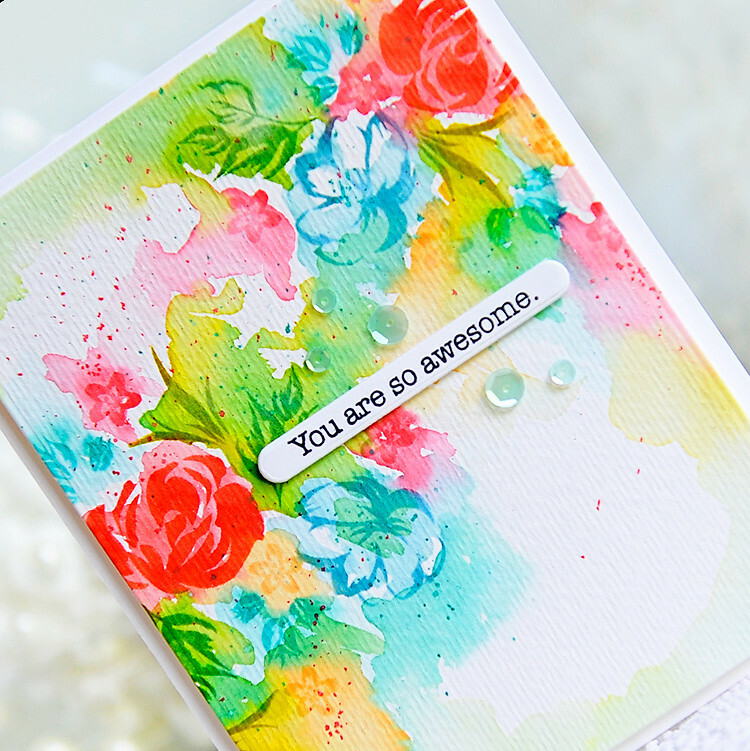 Your layout using the Watercolor Wreath stamps is beautiful as well. 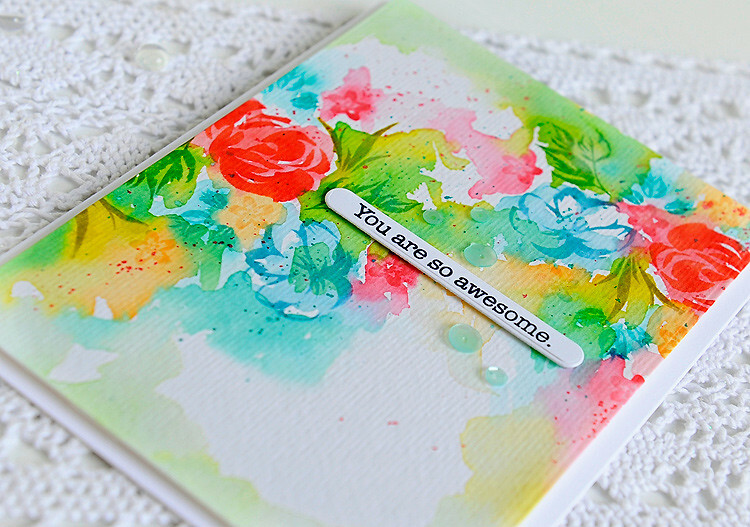 the water colored card made me swoon. those colors are delicious!! I keep bypassing "The Wave" stamp. But, the way you used the stamp on your first card really is calling to me! With the flowers in front of the wave makes it really pop out. The water coloring on your second card is fabulous! The way you explained the technique you used is very helpful, thank you. Absolutely stunning!!! I love how you used the wave stamp and the flowers together!!! Hi Kay! I've had so much trouble leaving a comment until I realized using my husband's Kindle, didn't recognize my information. (My Kindle finally took a powder). When I first saw your cards, I thought outloud, oh my gosh. I shared them with my husband and he echoes my sentiments. "Has she ever considered going commercial"? Every card is my favorite! :) I hope you have a relaxing and fun summer ahead ( you deserve it!) and may God bless you Kay. Beautiful cards, Kay! Love the gorgeous Flowers & that amazing wave! Great water colored cards. Very pretty! Thank you for sharing! Wow looove your cards! Stunning! Oh your flowers are so beautiful! Beautiful cards. Especially love the "Awesome" one. Your coloring really is awesome. Both of these cards are beautiful beyond words! I love how you use colors/water/paper to come up with the lovely-ist things. Truly artistic & original. Can recognize your work anywhere! Just stopped by to see what Kay has been up to, and good golly, Miss Kay, BLOWN AWAY!!! No one does a bg like you! From the waves of aqua blue to the blended colors hi lighting florals, gorgeous! Simply gorgeous!! !